Genres of books simply specify what categories or sub-categories does a book belong to. If you are a regular book reader, you probably already know about some book genres that you have read or that you love reading. In this post, you will learn about the two main types of books and their sub-categories which we commonly refer to as genres of books. All the books can be broadly classified under two main categories: FICTION and NON-FICTION. Fiction books contain a made-up story – a story that did not actually happen in real life. These stories are derived from the imagination and creativity of the authors and are not based on facts. The Alchemist by Paulo Coelho, 1984 by George Orwell, Harry Potter Series by J. K. Rowling are some of the examples of fiction books. Non-fiction or nonfiction books are factual books. Unlike fiction books, they are based on facts and information that can be verified to be true. Some examples of non-fiction books are The Autobiography of Benjamin Franklin by Benjamin Franklin, How to Win Friends And Influence People by Dale Carnegie, an encyclopedia, etc. Sometimes you may come across another category named semi-fiction. Do not be confused. Even semi-fiction books are taken to be work of fiction. Apart from the made-up story, these books also include some factual information. For example, the famous book The Kite Runner by Khaled Hosseini is based on real historical events of Afghanistan, but the story told in this book is actually a made up one. The above types of books can be further divided into many sub-categories and each of these sub-categories is a genre. We will discuss the different genres of books under fiction and non-fiction categories. 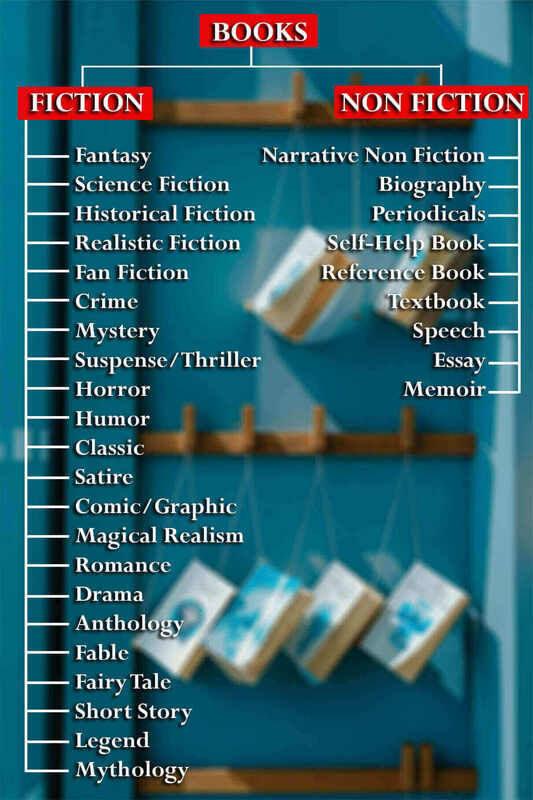 Above picture shows a flowchart of different genres of books. Each of these are briefly explained below. Number 1 to 23 are book genres under FICTION category. The stories under this genre usually show an event or a series of events that happen outside the course of the protagonist’s ordinary life. The plot is mostly accompanied by danger and physical action. These stories almost always move quickly and the high pace of the plot is usually an important part of the story. An anthology is a collection of series of works such as short stories, poems, essays, plays, etc. by different authors into a single volume for publication. The selection of such works is made based on some common theme or subject of books and usually done by an editor or small editorial board. Classic refers to the fictions that are accepted as the most important and influential books of a particular time period or place. These books are widely taught in schools. These books are based on a sequence of hand-drawn pictures. The story is usually told visually with very few words and those words are mostly placed either in panels on top or bottom of pictures or as speech bubbles. As the name suggests, this book genre deals with crime, criminal motives and the investigation and detection of the crime and criminals. Dramas are stories composed in verse or prose, usually for theatrical performance, where conflicts and emotions are expressed through dialogue and actions. Fables are fictional narratives in prose or verse that typically features personified animals, mythical and legendary creatures, plants, etc. as the main characters. The characters in fable possess human qualities, such as the ability to speak in human language. These legendary tales demonstrate some useful truth and are meant to teach a moral lesson. Fairy tale is usually a story for children that involves imaginary creatures and magical events. Fan Fiction, as the name suggests, is a fiction written by a fan of a particular book or book series. The characters and the plot of fan fiction are usually taken from the original work but the story is different. A Book under this genre contains a story set in a fantasy world – a world that is not real and often includes magic, magical creatures, and supernatural events. Historical fiction is a genre of book that includes writings that reconstruct the past. The story is set in the past keeping the manners, social conditions and other details of that period unchanged. The writers incorporate the past events or people in their fictitious stories. Horror is a genre that is intended to or has the ability to create the feeling of fear, repulsion, fright or terror in the readers. In other words, it creates a frightening and horror atmosphere. Humor fiction is usually full of fun, fancy, and excitement. It is meant to entertain and sometimes cause intended laughter in readers. It’s a story, sometimes of a national or folk hero that is considered to be based on facts but also includes imaginative material. Narratives in this genre may demonstrate human values, and possess certain qualities that give the readers a reason to believe in the tale. It is a genre of book wherein magical or unreal elements play a natural part in an otherwise-realistic environment. Mystery books have a suspenseful plot that often involves a mysterious crime. Suspects and motives are considered and clues throughout the story lead to a solution to the problem. These books include a legend or traditional narrative, often based in part on historical events, that reveals human behavior and natural phenomena by its symbolism and often pertaining to the actions of the gods. Realistic fiction has a story that is true to life and seems real but isn’t actually real. Stories under this book genre are often set in modern times and have characters who seem like real people. The primary focus of romance fiction is on the relationship and romantic love between two people. These books have an emotionally satisfying and optimistic ending. Satire is a genre of book that entertains making fun of vices, foolishness, shortcomings, etc. of individuals, corporations, government, or society through sarcasm and irony. It is often done with the intention of inducing the sense of improvement among people. Although satire is usually meant to be humorous, the humor often shows the dark truth of the society and is meant to work as constructive social criticism. Science Fiction typically deals with imaginative and futuristic concepts such as advanced science and technology, time travel, extraterrestrial life, etc. The stories are often set in the future or on other planets. A short story is a short prose fiction that typically can be read in one sitting. The stories under this genre often do not have subplots. It deals with a few characters and aims at the unity of effect and often concentrate on the creation of mood rather than plot. This genre of book is characterized and defined by the moods they evoke among the readers, giving them heightened feelings of suspense, excitement, thrill, surprise, anticipation, and anxiety. Literary devices such as plot twists and cliffhangers are extensively used in this genre. Biography is a narrative on someone’s life written by someone else. When a person himself writes about his life, then the book is called an autobiography. An essay is usually a short literary composition that reflects an author’s outlook or point of view on a particular topic. A memoir is basically a collection of memories that an individual writes on moments or events that he experiences in his life. These writings are taken to be factual. Sometimes a Memoir is taken to be an autobiography, but they are actually different. An autobiography is an account of the person’s entire lifetime, but a memoir is an account of only a narrower set of the author’s experience. Narrative nonfiction (also known as literary nonfiction or creative nonfiction) is a genre of books that uses literary styles and techniques to create factually accurate narratives in a format that tells a story. Periodicals as the name suggest, are written periodically at regular definitive intervals. Newspapers, magazines, Journals are some examples. These are books that we refer to when we need some specific information. Some examples of this genre of books are a dictionary, an encyclopedia, an atlas, etc. Self-help books contain information that is intended to help the readers to solve their personal problems and make their life better. This is a public address or discourse written into a book. A textbook is a manual of instruction in any branch of study. It contains an authoritative and detailed factual description of a topic. Textbooks are produced as per the demands of educational institutions. Mathematics, science, and history textbooks taught in schools are some basic examples. Poetry is one of the most important genres of books in which the expression of feelings and ideas is given intensity by the use of distinctive style and rhythm. Poems written under poetry can be of different types according to the style in which they are written. Poetry can fall into both Fiction and Non-Fiction categories. If the poetry is based on facts, it will be a nonfiction poetry, and if it is not based on facts then it will be a fiction poetry. So, this was the list of genres of books with brief descriptions and examples. Although most of the important genres are covered in this article, there can still be some more that exist. If you are aware of any other genres of books that are not mentioned here, please mention it in the comment section below. I will add that too. Thank you, for the brief and well stated descriptions of every genre. How Much Does Amazon Prime Cost? Is It Worth It In 2019? How does Amazon Prime work in 2019? How Do Audible Credits Work? Do They Expire or Roll Over? 16 Longest Books on Audible, Each Over 78 Hours Long! How to Access Audible Desktop Site on Mobile? 2 Easy Methods! Audible Free Trial: Don’t Sign Up Before You Know These 7 Things! Amazon Prime Audiobooks: 57 Free Audiobooks with Amazon Prime!